As Jupiterians, we are proud to work together and try our best regardless of the task that we are given. This led us to choose the motto 'Semper Sursum' - Always Aim High. Whatever the task that we are given, us Jupiterians try our best and aim to reach for the stars. So far this year, we have performed fantastically in numerous events including: Mathletics, Poetry Slams, SPAG.com, Staff bake off and many more. This song was chosen as it embodies our motto and encourages Jupiterians to 'be the best' in all that they do. 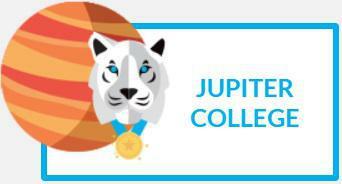 Jupiter is the largest planet in the solar system and was named after the king of the gods in Roman mythology and we hope to be the kings and queens of the colleges! Snow leopards are currently listed as an endagered species and are usually found in Central and South Asia. Take a look at the facts below to find out more! Snow leopards can jump up to nine metres. Snow leopards have long tails to help them balance, and keep them warm. Unlike other big cats, snow leopards can’t roar. Snow leopards can live up to 20 years old. To keep their feet warm, snow leopards have lots of thick fur on their paws. Snow leopards are most active at dawn and dusk. A female snow leopard gives birth to 2 or 3 cubs at a time. Snow leopards have light green or grey eyes, unlike other big cats, whose eyes are yellow / orange. Snow leopards rely on camouflage to hunt (and hide) in the snow. The snow leopard’s scientific name is ‘Panthera uncia‘.